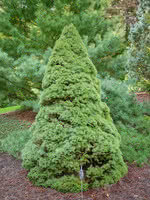 Dwarf Alberta Spruce is a small tree with very dense foliage. It is an attractive specimen in landscape designs and small yards. This plant naturally grows into the classic conical shape, but responds well to shearing and pruning. 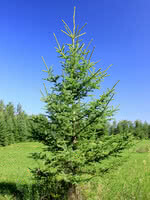 Dwarf Alberta Spruce is hardy and disease resistant. However, its thick foliage can collect mildew. Consider planting this tree in an open space where the wind can dry out its needles. You can use this cultivar as a substitute for cedar or juniper. These seedlings are greenhouse grown peat plugs transplanted to our bareroot fields for a second growing season. True to type and vigorous.